This recipe comes from a promo recipe sheet by Mazola Oil titled “National Chicken Cooking Contest Winning Recipes”. This was found in a large collection, date unknown. 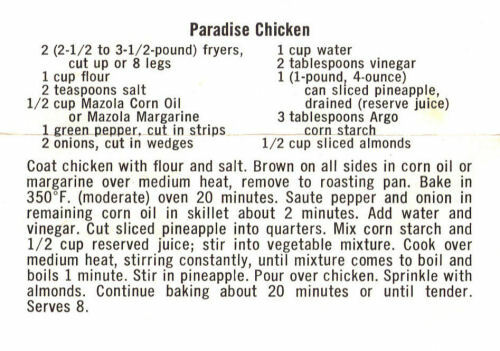 Recipe is typed below along with a scanned copy. Coat chicken with flour and salt. Brown on all sides in corn oil or margarine over medium heat, remove to roasting pan. Bake in 350°F. (moderate) oven 20 minutes. Saute pepper and onion in remaining corn oil in skillet about 2 minutes. Add water and vinegar. Cut sliced pineapple into quarters. Mix corn starch and 1/2 cup reserved juice; stir into vegetable mixture. Cook over medium heat, stirring constantly, until mixture comes to boil and boils 1 minute. Stir in pineapple. Pour over chicken. Sprinkle with almonds. Continue baking about 20 minutes or until tender. Serves 8.